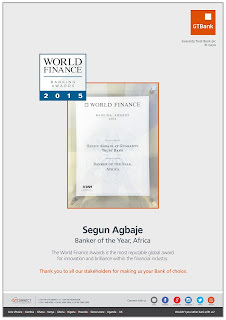 Foremost African financial institution; Guaranty Trust Bank plc has once again reaffirmed its position as a leading global brand with the recent recognition of its Managing Director/CEO; Segun Agbaje as Africa’s Banker of the Year during the 2015 World Finance Awards. Since 2007, World Finance magazine has been celebrating individual and company achievements, innovation and brilliance through its annual awards. The judging panel boasts over 230 years of financial and business journalism, supported by a research team that works relentlessly to ensure award winners are the most deserving in their sector. Every year, it provides a comprehensive coverage and analysis of the financial industry, international business and the global economy. The awards are tailored to provide a comprehensive analysis of the very best business leaders and institutions in each market. 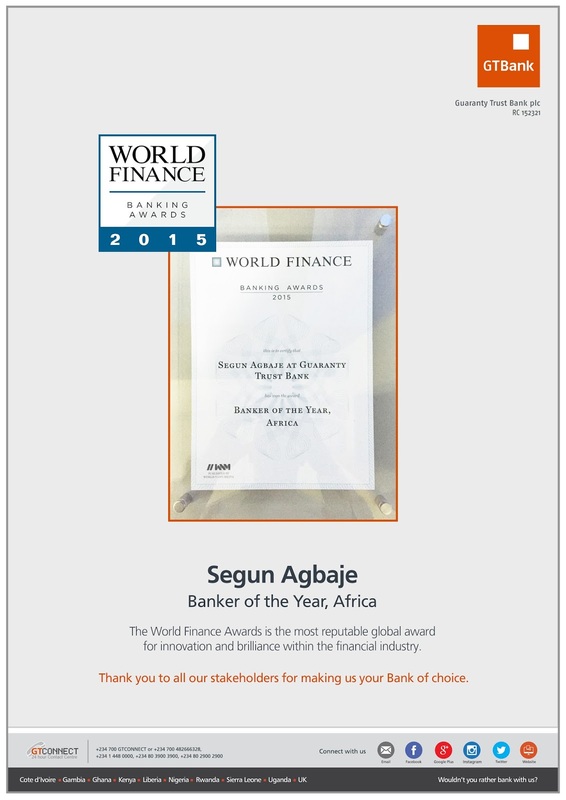 Commenting on the award, Segun Agbaje, Managing Director/CEO of GTBank said: “I am humbled and proud to be named Africa’s Banker of the Year. The successes and achievements recorded over the years would not have been possible without the collective effort and sheer determination of the staff, management and Board of the Bank in ensuring we remain true to our core values of integrity, transparency and excellence in service delivery. Our desire to always be at the frontier of excellence, enables us remain relevant to our customers and add value to all stakeholders. He further stated that, “As a Bank, we will continue to work tirelessly to maintain our position as a clear and distinct financial institution in the African banking space in terms of service, profitability and human capital while maintaining our position as Proudly African and Truly International brand”.